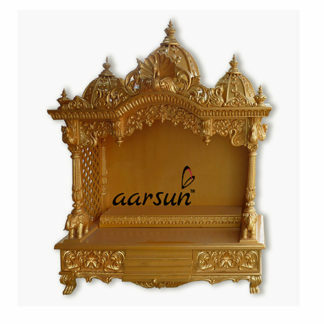 Aarsun Woods offers to you Wooden Temple for your home with beautiful carving and finishing. 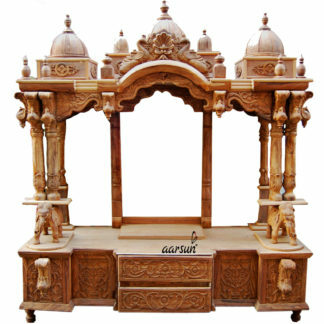 This temple will add more traditional and elegant look to your home as it is handmade and beautifully crafted by our experienced artisans. At the top of the temple there are three domes placed at the top with fine floral and leaf carving. There is beautiful mehraab area at the front of the temple in which peacock and flowers are carved.The Mehraab add more classic touch to this temple and below that there is main place of the deity. At the main place there are pillars carved along with elephants at the front are placed in welcome position. There is a single level placed at the deity area where you can place your idols and worship them. At the main place of the deity there is wooden teak ply used and there are placed at the side of the Temple. Below that there is base area where there are stairs placed at the side of the stairs there are carved area.Over the stairs you can place your deity’s feet or lighten up incense sticks. There are curve piers at the base area which uphold the whole temple. The temple will enhance the beauty of your home and will be a best place for your almighty. The temple will make you feel more close to your almighty and help you to maintain inner and mental peace.